After grabbing a day hikers permit at the Mill Creek Ranger Station and getting lost for a brief moment trying to find the elusive trailhead, Callie and I found ourselves hitting the San Bernadino Peak trail around 9:30 on a beautiful Saturday morning. Our day had started out under the cover of a thick set of clouds, but I was confident that hitting the mountains was the perfect remedy for that. By the time we were at the trailhead, we were well above the clouds and enjoying bright blue skies and the cool mountain breeze. The first section of this trail feels like your typical Southern California forest of oaks and pines. It was very reminiscent of my recent hike up the Marion Mountain trail. The primary difference between the two trails is that the San Bernardino Peak trail offers unimpeded views of the surrounding landscape far more frequently. The trail is on the the western edge of the San Gorgonio Wilderness, and once you ascend up about a thousand feet, there is nothing blocking your view to the west all the way to the San Gabriel Mountains. The first few miles of the trail ascend at a steady but moderate pace, and after a couple thousand feet of elevation gain, the grade begins to flatten out and the forest slowly starts to thin out. The plateau here extends for quite a while. It is about a mile of nearly flat hiking over 8,000 feet high, which is a rare thing to find and always a pleasure to take in. As we traversed the ridge, our first views of San Bernardino Peak came into view, along with its sister summit to the east. As the trail begins to ascend again, the views towards Los Angeles continue to become more impressive, and the landscape becomes increasingly sparse which allows for open vistas for the remainder of the hike. This is what hiking in the high country is all about. After about 6 and a half miles and over 3000 feet of elevation gain, the trail reaches Limber Pine Bench Camp at an altitude of 9300 feet. I had read that this is one of the best camping spots in Southern California, and now that I’ve seen it firsthand, I’m already excited about the opportunity to return on an overnight trip. The bench sits on top of a ridge with an incredible view of Los Angeles. I imagine on a clear night, the view of the city lights stretching off into the distance must be dazzling. There is no water at the camp, but thankfully there is a source a third of a mile up the trail. Limber Pine Creek is already a trickle, and the summer season hasn’t even begun yet. I expect this creek will dry up over the next month, so if you are inspired by this post and want to go backpacking to Limber Pine Bench this season, I’d recommend you go as soon as possible. I was carrying all of my water for the day, but Callie enjoyed having an opportunity to soak her paws and have a drink from the stream. In fact, she didn’t even need any other water for the day other than this one source and her constant consumption of snow. Speaking of snow, we began running into it with some regularity after reaching Limber Pine Creek. A storm from a couple weeks ago had blanketed the whole area in snow which had finally melted out enough to allow easy access to the summit. I had a pair of microspikes with me, but we never reached a place where they were needed. From the creek, the trail climbs up steeply towards the ridge directly on the eastern side of the summit. Upon reaching the ridge, a whole slew of new views open up. Notably, the view towards the south showcases another popular part of the San Gorgonio Wilderness. The Forest Falls area where the Vivian Creek trail starts is visible at the bottom of the valley almost a mile below. Beyond the valley, Little San Gorgonio Peak rises prominently but is overshadowed by the rugged northern face of San Jacinto in the distance. From here, it’s a brief stroll to the summit, where you will find a summit register and hopefully no one else to diminish the trail’s solitude. The views from the summit are mostly blocked by surrounding trees, which is the probably the biggest drawback to the hike. Fortunately, the trail up the peak delivers plenty of great views. It’s rare to reach a 10,000 foot summit on a weekend in Southern California and have it all to yourself, so I was quite happy to find the summit empty on our arrival. We relished in the opportunity to bask in the mountain sun for awhile without a care in the world, and Callie was even able to sneak in the elusive summit nap. To the east of the summit, the trail continues along the ridgeline towards San Gorgonio Peak. This section of trail is known as the Nine Peaks Traverse, and now that I’ve seen it, it is near the top of my list of future hikes. The traverse is a 27 mile point to point hike, so logistics are the biggest hurdle in taking it on. However, when there is a will, or in this case an awesome trail beckoning, then there is always a way. We’ll be back soon enough, but for this trip, San Bernardino Peak was the end of the line. Hiking back down the way that you came up is always a little bittersweet. The goal of the hike has been attained, and you don’t even get new ground to cover on your return to the car. In the case of the San Bernardino Peak trail, you at least get treated to much better views on the descent. The open aspect of the trail really shines here, as you are frequently given spectacular views of the surrounding mountains. The cloud cover over Los Angeles remained for the rest of the day which further highlighted the views and accentuated the feeling of isolation that the mountains provide. After dropping back down to 8,000 feet, the forest grows thick once again, and the epic vistas from the upper mountain are replaced by more intimate scenes. The afternoon light trickling in caused everything it came into contact with to glow in vibrant splashes of color. Each corner represented a completely different scene waiting to be unveiled. As we continued to descend, we reached the clouds that we had been looking down on all day, and we were suddenly surrounded by them. With no more sun poking in through the trees and only a couple hours of daylight left, there was no reason to linger anymore, so we charged down the last couple miles of trail and were back at the car early enough to get home in time for dinner. Another amazing day in the mountains, and one more trail to check off my list. Do it Frank! It’s beautiful up there right now. Yet another Southern California hike to add to my list. This Northern California hiker is going to have to take a month long vacation someday to explore all of these great hikes! Thanks! Is the trail well marked or obvious? 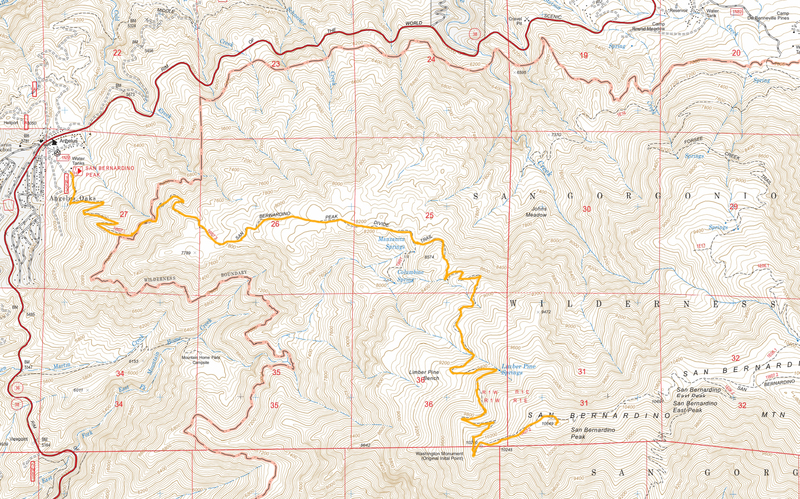 Im a rookie looking for a fun weekend hike but dont wanna get lost lol. The trail is well marked. The trailhead… not so much. I would not worry about getting lost. You should find others on the trail on a weekend too. I think we are going to do this end of May. I know it’s hard to say, but do you think that creek will be totally dry this year? I wouldn’t count on there being water there by then. Consider it a pleasant surprise if there is any left. If you do end up going, it would be great if you could report back to help inform future hikers. Have fun!